Recently named Young Conservationist of the Year 2013 from Australian Geographic, Linh Do has been working from a young age to create lasting social change in her community and across the globe. In 2006, at the age of 15, the Melbourne-based teenager became determined to bring positive environmental change. She started the Change A Million Light Bulbs project, which aimed to convert one million light bulbs from incandescent lights to energy efficient florescent ones. Through her grassroots efforts using social media and word of mouth, she was able to not only change one million light bulbs, but also amend Australian legislation to phase out the sale of incandescent light bulbs in 2007, becoming the first country in the world to pass such laws. Within her campaign, Linh Do asked people who changed their light bulbs to write to their local parliament members and this caused Australian legislation. 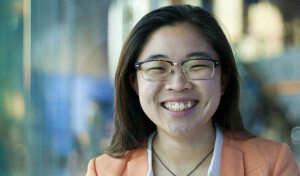 Linh Do was awarded Australia’s Young Conservationist of the Year 2013 for her efforts to increase the country’s environmental sustainability. This early start only propelled Linh to continue working for environmental sustainability and social justice. She worked for two years for the United Nations Environmental Programee as a youth advisor for the Asia-Pacific region. In that role, she attended the UN Commission on Sustainable Development (UNSD) and UNEP’s Governing Council(GC/GMEF) meetings. Linh has also worked with a variety of national and international youth climate coalitions including the Climate Project, Make Poverty History, and the Alliance for Climate Protection. Furthermore, she has focused on increasing civil journalism standards for UN climate change negotiations through the organization Change & Switch. The Guardian, ABC, and the Age have featured writing pieces from this project. She is currently an editor of The Verb, which has a diverse team of writers that engage in in-depth analysis of complex issues facing the international community. The Verb has been syndicated to Al Jazeera, Reuters and The Huffington Post. Linh is also a co-founder of OurSay, which emphases democratic engagement of Austrailia’s leaders and citizens. Through the asking and answering of tough questions, OurSay creates communication between Australians to discuss and debate local and national issues. At first glance, it may seem an impossible challenge to try to emulate her extensive achievements. However, in a TEDxChristchurch speech, Linh, a frequent public speaker, claims that one doesn’t need a degree or qualifications to make change. One merely has to make daily conscious decisions to challenge the status quo. During her speech, she spoke to the necessity of defying social norms in order to enact change. She said that as a fifteen year old, during her first campaign, she was not seen as someone capable of having a large or sustainable impact. However, one can see by the results of Linh’s efforts that age does not define ability to generate change. She is proof of the ever-reaching effects of seemingly small decisions. Linh began by simply changing light bulbs and is now working with international leaders to address climate change. She is truly a leader in her field and shows us that through even our small decisions we can have a lasting impact on the world around us.